(Trent Nelson | The Salt Lake Tribune) The Utah Jazz introduce their top draft pick Grayson Allen in Salt Lake City, Wednesday June 27, 2018. (Trent Nelson | The Salt Lake Tribune) The Utah Jazz introduce their top draft pick Grayson Allen in Salt Lake City, Wednesday June 27, 2018. (Trent Nelson | The Salt Lake Tribune) The Utah Jazz introduce their top draft pick Grayson Allen in Salt Lake City, Wednesday June 27, 2018. (Trent Nelson | The Salt Lake Tribune) The Utah Jazz introduce their top draft pick Grayson Allen in Salt Lake City, Wednesday June 27, 2018. 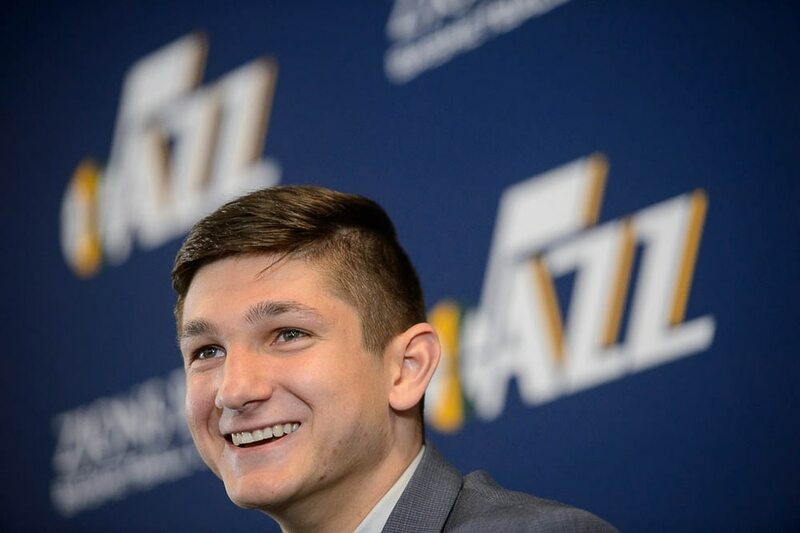 (Trent Nelson | The Salt Lake Tribune) The Utah Jazz introduce their top draft pick Grayson Allen in Salt Lake City, Wednesday June 27, 2018. (Trent Nelson | The Salt Lake Tribune) The Utah Jazz introduce their top draft pick Grayson Allen in Salt Lake City, Wednesday June 27, 2018. (Trent Nelson | The Salt Lake Tribune) The Utah Jazz introduce their top draft pick Grayson Allen in Salt Lake City, Wednesday June 27, 2018. General manager Dennis Lindsey at left. (Trent Nelson | The Salt Lake Tribune) The Utah Jazz introduce their top draft pick Grayson Allen in Salt Lake City, Wednesday June 27, 2018. (Trent Nelson | The Salt Lake Tribune) The Utah Jazz introduce their top draft pick Grayson Allen in Salt Lake City, Wednesday June 27, 2018. A number of years ago, an elementary school in Jacksonville, Fla., had an assignment: Students were to trace the outlines of their bodies, then in that space, draw what they would grow up to be. Sherry Allen’s son always had a strong vision for what his future held. 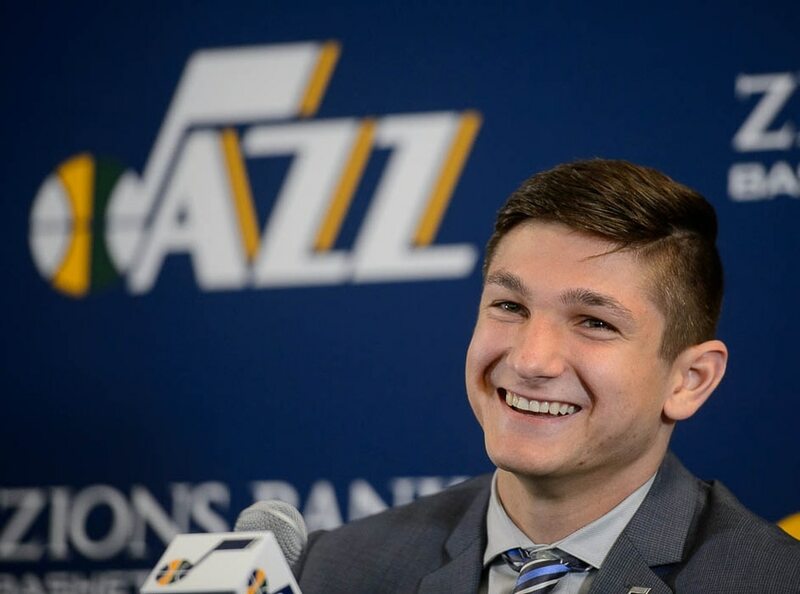 A decade-and-a-half or so later, Grayson Allen, 22, was introduced for the first time by the Utah Jazz, the NBA team that selected him No. 21 overall in last week’s draft. They gave him a jersey, No. 24, that he didn’t have to paint himself. This part of the dream is achieved. 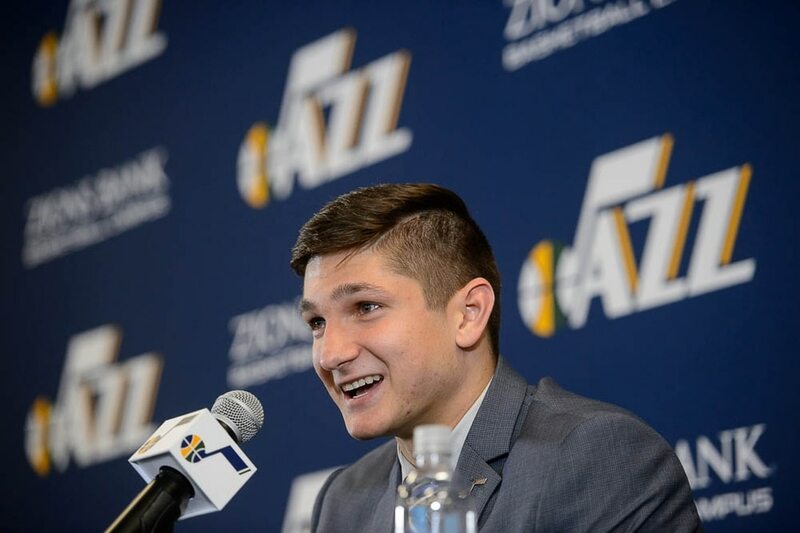 In a roughly 15-minute press conference, Allen talked about his excitement about coming to Utah, his fit in the Jazz system, his anticipation of practicing against Donovan Mitchell and his desire to have a strong Summer League performance. But the four-year Duke graduate didn’t spend much time hoping he can changed the polarized opinions about him formed during his college career. There was a time when he cared — too much, he admits now. But as he steps forward into his Jazz career, he’s not going to worry about the outside noise anymore. Make no mistake: Passion is one of Allen’s defining traits. Beyond the shooting the 6-foot-5 guard showed in workouts and the athletic numbers he wowed with at the NBA Draft Combine, Allen has a competitiveness the Jazz coveted in the pre-draft process. They identified a relentless, tough-minded competitor who stood out in big games and workouts. In his career at Duke, Allen has a lot of highlights. He had a clutch performance with 16 points in the 2015 national title game when other future lottery picks struggled. He hit a buzzer-beater against Virginia in 2016, and scored a career-best 37 points against Michigan State (in a then-No. 1-vs-No. 2 matchup) last season. A former Louisville man, Mitchell split four meetings with Allen’s Duke teams. He always came away annoyed by Allen’s competitiveness, but also with a grudging respect. The flip side of Allen’s attitude, however, has been several ugly tripping incidents as a sophomore and junior — a “hip check” against North Carolina as a senior has been up for debate. There’s a rich history of Duke players being some of the most reviled in college basketball, as Christian Laettner and J.J. Reddick know well. But Allen’s tripping combined with his status as a Blue Devil put him in rarefied air. Sherry Allen said there were times when it was hard to watch as a parent. The Grayson she raised, her only child, is shy and polite. In an era where college basketball programs are temporary hindrances on the path to the pros, Grayson embraced his education and stayed, even when people told him he could make millions. After being drafted last week, Grayson came back home to Jacksonville, mowed the lawn and emptied the dishwasher. She couldn’t understand how people who didn’t know her son well could make hard and fast judgements about him based on his moments of weakness in his games. But there’s a flip side to that: The Allens loved the support they got from Duke, and Blue Devils fans loved their son. Fans waited patiently after home games to get his autograph, and some of them gave him flowers. There’s going to be a lot more work to judge. Allen said he wants to be prepared as possible for Utah Summer League, which starts on Monday, hoping to use it as a “launch pad” for his career. He eyes Houston Rockets sixth man Eric Gordon as a model for his game — but he also thinks he can get better in other areas with the Jazz coaching staff. Allen has plenty of good memories to carry on from Duke, as well as his degree in psychology. He said he’s excited about connecting more with coach Quin Snyder, who is a fellow former Blue Devil guard. But does he bring baggage, too? He’ll let others talk about that. He’s here for the basketball.